ICTA Christian Junior Tennis Player, Anastasia Kharchenko, Wins First ITF Pro Circuit Title! 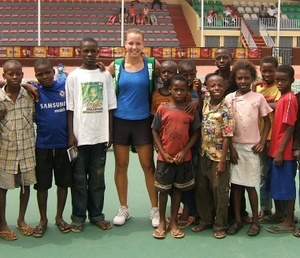 Congratulations to junior tennis player Anastasia Kharchenko who won her first ITF Pro Circuit Title while on an ICTA Outreach in Benin City, Nigeria! Ana, a member of International Christian Tennis Association Women’s Pro Tennis Team, which is a special group of high performance tennis players dedicated to sharing the Gospel of Jesus Christ, won the tournament without losing a set! 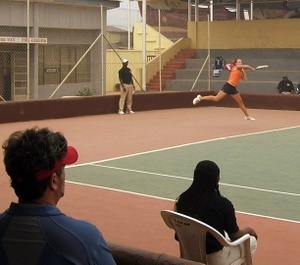 The team travels worldwide competing in ITF Pro Circuit tournaments. Each tournament they attend is a Christian outreach harvest field for them. The road from when I first met Ana to our journeying to Nigeria with her team is a special one that leaves us all standing in awe of the miraculous provision of God. 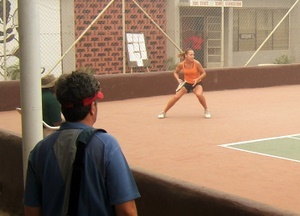 About 1.5 years ago, an ICTA Women’s Pro Tennis Team journeyed to an international tournament in Mexico. There they met Anastasia Kharchenko, who they discovered had been forced to endure abuse from her tennis coaches. 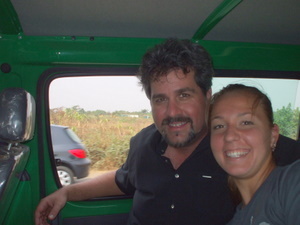 I will never forget Rachel Snelen, team captain, calling and asking me if I would be willing to coach Ana. When Rachel informed me Ana was from Ukraine, I nearly hung up the phone, as just a few months earlier I had been burned by Julia Vakulenko and had basically lost trust in Ukrainian players. You remember Julia, right? She’s the WTA pro player who had quit tennis, sank into suicidal depression, and became bedridden. God used me to intervene in her potential suicide attempt on Christmas Eve 2005. After the miraculous intervention, I brought Vakulenko to Florida and began rebuilding her on and off the court. I changed her tennis racket and strings to give her more control, taught her a topspin serve, and showed her the importance of hitting tight angles to pull her opponents off the court. Hours and hours we spent working on her ability to change the direction of the ball with power and confidence. We focused on strengthening her legs and her stomach, and spent hour after hour on footwork drills. Vakulenko fell in love with dribbling a soccer ball and riding mountain bikes. I poured into Vakulenko’s tennis at no charge for weeks hoping to re-light her fire for life. Like all my students, she improved daily and loved what and how I taught her. In addition, Julia had daily Bible studies with my other students, devotional time, and prayer time. We even traveled to an amazing Christian conference in Florida, and went to Georgia to listen to the testimony of a gifted Christian communicator. Daily for the first 6 weeks, and I mean daily, Vakulenko told me how happy she was and how grateful she was to God for sending me into her life and giving her a new start. She wrote me beautiful notes and cards showing her appreciation. While the first 6 weeks working with her were pretty good, the last 10-14 days were a living hell. I had confronted her on what seemed to be prescription drug abuse. She started going ballistic. Additionally, I confronted her to quit trying to recruit my students to either travel with her on the WTA tour or be coached by her mother in Barcelona. Which, according to my students, she had been secretly doing behind my back. I was beyond disappointed. She also had set her sights on having Marek Czerwinski as her boyfriend and travel partner. Marek was a full time student of mine and had recently held the #1 ranking in B18 USTA. She claimed she could help him be a top ATP player and could give him the confidence he needed, if he only traveled with her. I told Marek he needed to travel with several guys his age and ability level to about 35 ITF Pro Circuit tournaments a year for a few years, not shack up with her as the newest boy toy in her life! I told Julia to back off from the 18 year old boy! I decided to not coach Julia full time on the WTA tour. My last week with Julia was spent incurring her wrath. Even so, I stayed true to my initial commitment and flew her to Las Vegas to compete in the Tennis Channel Open, where she officially began her comeback after suicidal depression, while ICTA hosted a large-scale outreach to 50,000+ tennis fans. In Vegas after her first-round match, Julia apologized for her actions and gave me a big, thankful hug. For 10 minutes while standing next to the tennis court she cried, hugged me, and apologized for her actions the past couple weeks. I, of course, was glad. We then spent the day together, and part of the next. But, the apology was short lived as she quickly ran back to the people who seemed to have abused her, some of the ones she claimed had helped drive her towards depression, and she began bashing me at every opportunity… most likely because of the conviction she felt while shacking up with Marek, who had bought into her manipulation hook, line, and sinker. Before coming to train with me full time, Julia Vakulenko had an average WTA ranking of just 161 over a six year period. After my training her full time, the following two years saw her average ranking improve to 76 WTA with her highest ranking being 31 WTA. From what I understand Julia also earned prize money of approx $500,000 during those 2 years, more than doubling her total from the six previous years. She also defeated 3 top 10 WTA players, and made the 4th round of the US OPEN, her best Grand Slam showing ever. The statistics are there for anyone to view. There is a very clear line of distinction between her tennis ability before meeting and working with me, and her accomplishments after. There is also a clear line between Vakulenko the first 5-6 weeks before I confronted her on issues, and the two weeks following the confrontation. Personally, I have few thoughts for or against Vakulenko for my time with her. The past is the past. I hope she has matured and faced her demons head on. I also am not writing to pat myself on the back. I do not want or need new students and am not even slightly trying to use my success with rebuilding Vakulenko to make money. I have coached other players who can beat players like Vakulenko 6-0, 6-0. Most ATP players ranked in the 1000s could beat her 0,0. And guys ranked in the 1000s are generally just solid juniors or college level players. That said, rebuilding Vakulenko is nothing for me to brag about at all. Yet, though the past is the past and I have moved on long ago, I have recently discovered significant proof which seems to show Vakulenko has attempted to harm Ana’s blossoming pro tennis career. Yes, Ana. A girl who has never even met Vakulenko. A girl who has dedicated her life to Christ and to helping others. A young person trying to make something of herself in a tough world. The proof which has been brought to me has me thoroughly disappointed with Julia Vakulenko. Yet, before I share more publicly, I want to make sure what I have been shown is 100% true, though given the sources I have no reason to doubt its authenticity. And if this information is proven false or even only 99% true, I’ll be more than happy to report that as well. I could film a 10 hour documentary on the ridiculous Vakulenko soap-opera I’ve endured, but suffice to say you now have a better understanding of why I had no interest in training a Ukranian. As you can see, when Rachel called to inform me of Anastasia’s situation and told me she was a Ukrainian, I was less than thrilled. But, Rachel made a good argument and helped me get past my issues to see Ana’s desperate need. Ana quickly flew to Florida and escaped her abusive situation. It was a pretty funny scene as we both stared at each other in the Daytona airport. I didn’t trust Ukranians and she didn’t know who the heck I was! 4. What man of you, having a hundred sheep, and having lost one of them, doth not leave the ninety and nine in the wilderness, and go after that which is lost, until he find it? 5. And when he hath found it, he layeth it on his shoulders, rejoicing. 6. And when he cometh home, he calleth together his friends and his neighbors, saying unto them, Rejoice with me, for I have found my sheep which was lost. 7. I say unto you, that even so there shall be joy in heaven over one sinner that repenteth, (more) than over ninety and nine righteous persons, who need no repentance. Ana has worked hard from the first day she trained with me. She is relentless in her ability to push her body as far as it will go. Her athletic genes she received from her father, who was a Ukrainian track star, have helped her tremendously. Yet, what impressed me more about Anastasia is her hunger to improve in all areas of her life. Once she became a believer in Christ, Ana began reading every book she could on the Christian faith. This is especially impressive when you consider she had never read a book in English before! Ana thoroughly enjoyed attending church, studying her Bible, and attending Christian conferences and concerts. Like a sponge she soaked it all in. After much work improving upon Ana’s strengths in tennis, rebuilding her weaknesses, and defining her style of play, Ana hit the junior circuit in Florida… and went undefeated. Anyone watching Anastasia compete understands she has the potential to become a professional tennis player. Yet, there is a great distance between juniors and pros. Even a junior as talented as Ana, who clearly is equal to any top 10 ITF ranked junior, is currently only at a level to be competitive with players ranked 250 WTA and below. Study top 100 ranked WTA players and you quickly realize the “overnight sensations” often took between 4 and 7 years competing on the ITF pro circuits to gain a high enough ranking to compete at WTA tour level events. For Ana, this is year number two in her development. Currently, Ana is not thinking about competing in WTA level tournaments. She knows her upcoming new WTA ranking of approximately 725 is good, but nothing spectacular and that she has a lot of improving to do on her game. 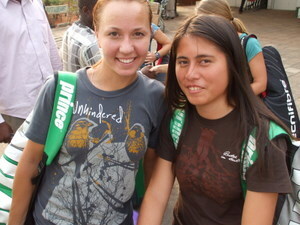 She is enjoying training and traveling with her friends on the ICTA Women’s Pro Tennis Team. 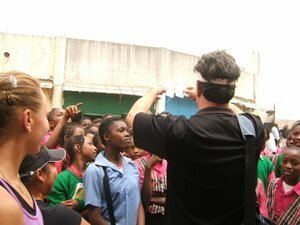 Ana is a Christian missionary spreading the Gospel of Jesus Christ to those she meets. While tennis is important to her, she knows God may have other plans for her life. To say I was extremely glad for Anastasia as she won her first ITF Pro Circuit title would be an understatement. She has worked hard and completely deserves to win. No one anywhere has worked harder. Anastasia Kharchenko has beaten the odds and has earned a rare WTA ranking. 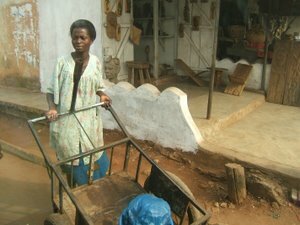 Along the way God has been working in her life and teaching her life is about helping others, not herself. You’ve done a great job on and off the tennis court. You know God has blessed you with an ability to use your life for His will to be done. The willingness you have to appreciate God’s blessings and use them to share His name to others is an inspiration. Most people reading this article have little knowledge of the abusive damage done to players by the tennis system as they attempt to rise to the top of the pro rankings. Julia Vakulenko and Anastasia Kharchenko are prime examples of great kids who have been battered by dysfunctional, criminal tennis coaches in a truly Godless international tennis industry. 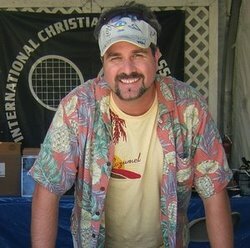 As a person who works full time in tennis as a missionary and ministry founder, I can assure you demonic spiritual warfare is alive in tennis and working to destroy as much as possible. Honestly, I don’t blame someone like Vakulenko for being who she is. She can’t help it. The tennis system has used and abused players for a long time. Top players often have no idea how to be kind and giving, functional, Christ-like. But, I do hold players like Vakulenko accountable for their pathetic actions. Such players cannot continue to be the moral compass of professional tennis and the example for youth to follow. The only compass in tennis must be Jesus Christ. Not me, not you, not Ana or Julia… Jesus Christ crucified and nothing else. Organizations, such as the International Christian Tennis Association, must be willing to take on the tough tasks of developing top players and giving them the opportunity to travel worldwide in the name of Christ. Tennis players can be developed as Christian missionaries. Junior, pro, and college tournaments can be developed as a gathering place to share the Gospel of Jesus Christ. Tennis industry companies, such as racket and string manufacturers, can be developed based solely on Christian principles. 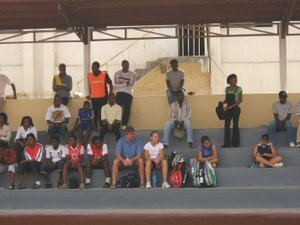 Tennis academies can be developed to add Christian values to the lives of those attending. …reach them and you can win nations for Christ. Again man, what a blessing to be doing such radical outreach in a world starving for it. Props to Anna, for winning both tournaments, it really shows what hard work(waking up at 7 am and doing footwork among other things haha) and a passion for God can do in your life. I love the stories and the pictures really cool man! I know that this is probably the beggining of many great tournaments for your favorite ukranian, but keep on fighting to good fights, SS( Superman Scott) and may god continue to bless. I hope all is going well now that your safe back home, i heard sum crazy things from my mom and i know that it was a really tough time over there for you guys. Im currently in Ohio! Xenia haha at the Athetes In Action headquaters doing sum training, i came up with steve, he said he met you a while back. i dont know if you remember hes works at ___ overseeing ___ and chaplains the ___ and ____, a cool guy, but not as cool as you :D. So im up here learning a bit of corporate stuff, public speaking, evangelism outreach, and campus training among other things. kickin back at athletes in action, huh!? awesome! learn everything u can, little bro. mo is betta. 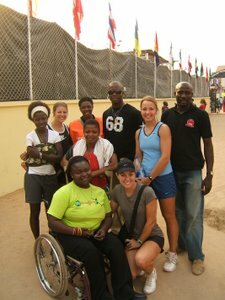 ana played awesome in africa. really awesome. winning 11 matches in a row in those ridiculous conditions was really amazing. two weeks of our days were in sand storms, little if any food was available (so glad we brought our own), tennis center usually had no electricity, toilet paper was a prized possession… and people were literally trying to harm us as i worked to expose how radical islam is using sports to manipulate and indoctrinate youth in their holy war. good to be home, go to church, and eat some queso! I went to your wedsite and what i saw is intresting. I love what you are doing. May GOD gives you the strienth and wisdon to carry on. I LOVE YOU. Its amazing what God’s doing in the ministry and how He’s using you to reach out to the world. You are a Blessing Scotty.. and thats because you are divinely favored by our Father!! you’ve done a Great job and have handled certain situations with wisdom and confidence. you’ve helped me in many ways and I thank God for you. I really hope to see u guys sometime soon or later. I’ll say it again… I miss u guys alot!! I pray all goes well with everyone and may our Good Lord continue to Bless you and the academy abundantly!! God Bless and keep up the good work for His Glory!! i thought that might be you flippin through our web site… i saw a bunch of hits from new zealand! all is well here. ana, rach, n mel are hanging w/ nasser n playing a 25k in pelham. i’m good. a little grayer, maybe a little fatter… but good! to say we miss our prayer warrior is an understatement. Am really impressed at what God has done in the life of Anna. glory be to God. I know one day he will also visit me and make me surrender to him totaly and also work for him in getting souls for Christ. I have the drive to work for God but some how, I dont know how to start. I have been praying for your accademy , i always remember you in prayers but i need your suggestions on how i will start the evagelism with you people to reach my fellow Tennis players. Thanks and remain bless sir. Keep doing what the Lord has anointed you to do.